Joseph Schumpeter's Capitalism, Socialism and Democracy. You’ve got to admire a man who regularly wore a cape. This goes doubly if that man is an economist. But Joseph Schumpeter was no ordinary economist. 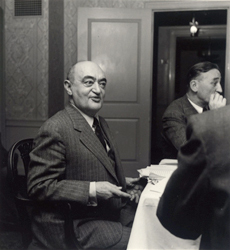 Ending up at Harvard in the early 1930s, Schumpeter was an exile from the tumult of Central Europe, an orphan of the Austro-Hungarian Empire. He lost his mother, wife, and infant son all within a few months of each other. It was not difficult for Schumpeter to see the world as tragic, arbitrary, capricious.